It seems like there is no word too early to do business. 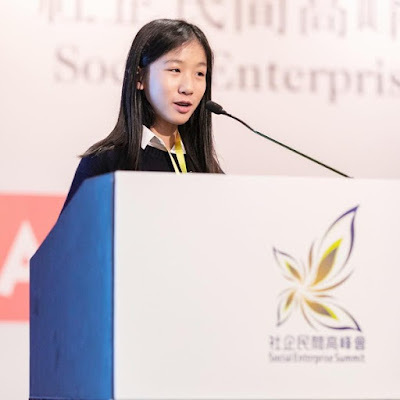 Just look at the 13-year-old girl who has started to open a business at this very young age. The girl named Hillary Yip has even become CEO. Besides being able to do business since childhood, Hillary is also inspiring because of her mission to revolutionize children about language learning method. Hillary Yip Ying-hey found an application called MinorMynas at the age of 10. This iOS application has been downloaded 40 thousand times in 50 countries. MinorMynas intends to help learn language where it not their mother tongue. Hillary thought of creating this application when she found it is difficult to learn Mandarin. "Adults have various types of social media and it's not difficult for them to talk to people online. But for children, we have nothing. We are stuck with school, friends, or video games. So we have to connect children in a safe environment , "she said. Hillary's brilliant idea also won the AIA Emerging Entrepreneur Challenge in 2015. After that, the idea was really poured into an application after a developer was interested in Hillary's pitch. The creation of the application was not separated from the support of her mother who is the co-founder of MinorMynas. "I made MinorMynas in the summer of 2015 when I learned Mandarin in Taiwan. My Chinese language was very bad when I first came, but after the exchange program I saw how much I developed and the experience was attached to me," she said. MinorMynas is an online education platform that aims to help children learn languages from chatting while live videos with their age-old children. With direct interaction it is expected that children can more quickly grasp other languages. "What I think is interesting about this application is that the connections between children out there are quite robotic and there's not much to do. While MinorMynas gives them the opportunity to connect with children their age and break cultural boundaries,"
"The world does not operate in textbooks and if children have the opportunity to get that knowledge and use it, then it will be more useful than tutor sessions or other chapters in textbooks," she said. As a business girl, Hillary Yip chose Michelle Obama as her role model. "I think she's a very inspiring figure. I think it's something to be admired that she used to leave a high-paying job and work for the community and make an impact where he lives. If I meet her, I want to say that this is an interesting time for women like me and others to work and make the world better. " She also has a message for fellow female entrepreneurs who want to succeed in business. "It doesn't need to be bothered with other influences because there must be someone who understates you and says you can't. What's important is to get up from criticism. If that is useful, consider it. If not, just ignore and do what you want to do," Hillary said.